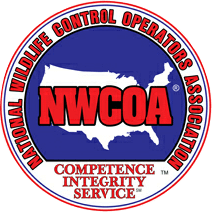 Hogarth’s Wildlife and Animal Removal specializes in Skunk removal. Skunks are nocturnal mammals that do not hibernate. A Skunk is easily identifiable by its black fur and two white stripes running parallel to their back. They are notorious for their potent odor and for burrowing under decks, sheds, crawl spaces, porches, and woodpiles. Skunks typically have a lifespan of 1 to 4 years. Mating season starts in February and goes until March. Skunks give birth to one litter per year with 2 to 8 juveniles. A major concern with skunks is not only the odor, but that they are primary carriers of rabies and are vectors for spreading the virus. Once a skunk has burrowed under a deck, shed, or other area, they will return to the same den every year unless properly excluded by a professional. 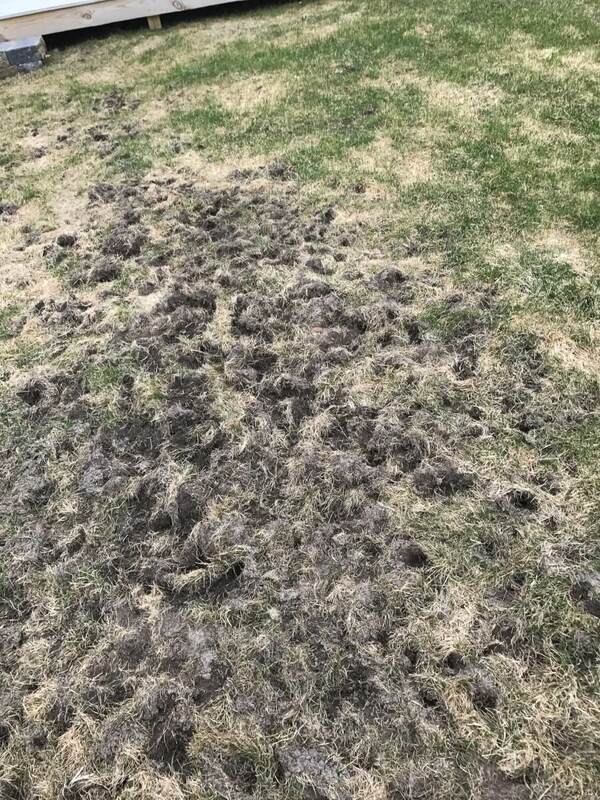 Skunks will also dig holes in lawns and gardens when searching for grubs in the soil. 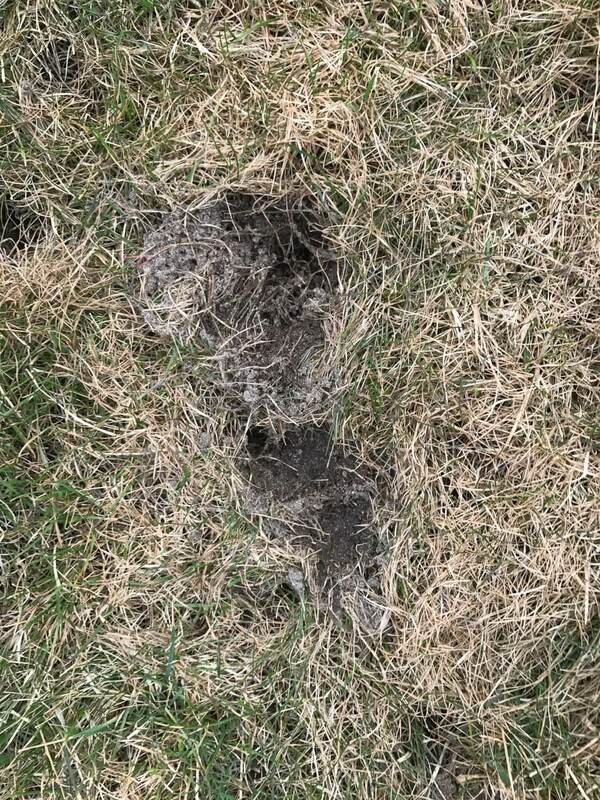 Customer will often find stamping marks and dug up grass in their yards from skunks grubbing around the property. 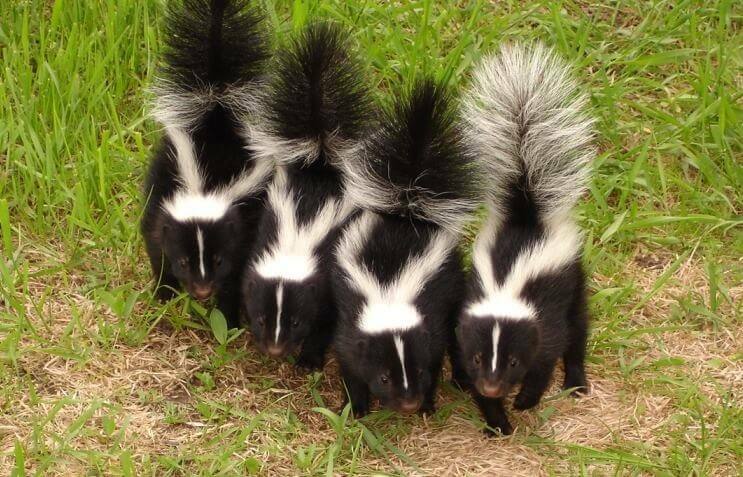 Skunks can spray for a multitude of reasons but the main reason being self defense. Typically before a skunk sprays it will warn the intruder by pounding on the ground with its front feet or by leaking a small amount of fluid to remind the intruder of its smell. Skunks will spray without hesitation if they have been extremely frightened by a loud noise or a dog barking, which can lead to a very unpleasant experience. The skunks essence, which is a yellow creamy substance that is sometimes called mercaptan, can burn eyes and make other animals reconsider eating them. Typically if a skunk sprays it essence due to a dog or another animal it will move on from the area that is was occupying. Skunks are actually very clean animals, and much like a cat they clean themselves daily. How far away should you stand to avoid their spray? The answer to this question will depend on the geographical location a person is in. Depending on the biologist, a skunk can spray anywhere from twelve to eighteen feet. From personal experience a skunk will usually spray anywhere from six to ten feet. The essence does not shoot out like rocket a lot of people would assume, but rather more like a squirt gun. A person can watch the stream of essence leave the skunk and usually dodge it if standing far enough away. A person must consider a couple things when trying to avoid the spray: wind direction, wind speed, and who has the higher ground. All of these factors combined will help calculate how far the skunk could potentially spray. A common skunk myth is that they cannot spray when they are lifted off the ground by their tail. This is false, as a skunk can spray without hesitation. Currently, we are not aware of any long-term health related dangers associated with a Skunk’s essence. However, people with asthma and those sensitive to odors have complained of difficulty breathing or even throwing up. We recommend that these people seek fresh air and expose themselves to as little of the odor as possible. Make sure the Skunks are no longer inside of their den under a porch, shed, etc., or have been trapped and relocated. Note: if the smell lingers at the same strength for over two weeks, then the skunk could have died under the area it is occupying. Find out if the space is enclosed, such as a crawlspace or underneath trailers. It is imperative that the area is ventilated as much a possible, while also ensuring a re-infestation will not reoccur by securing the ventilated areas. Clean the home or areas that the odor has penetrated by mopping floors or lighting candles. It can take up to one month or longer to be completely odor free.